well. As stated by Benjamin Talton, “the year 1960 is a significant symbolic marker for the start of many processes tethered to African political autonomy, including a more Black centered struggle against White supremacy fought on the continent and in the United Nations”. 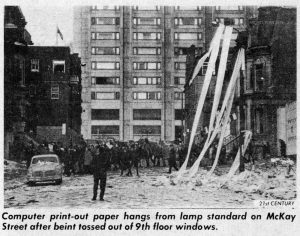 An important moment for Black Canadians in Canadian history was the Sir George Williams Affair of 1969, a peaceful protest-turned riot that took place at Sir George Williams University in Montreal, now known as Concordia University. The reason for selecting this as an important moment is because it brought attention to the issue of racism in Canada. It promoted progression of thought by raising questions about how the country was treating minorities, and how racism was being handled. In addition to demonstrating discrimination and injustice and bringing attention to these things, it is relevant to us because we are students in a university, and although this moment happened decades ago, it has influenced the way our schools are run today; they are more open and welcoming, and do not tolerate racism. In 1969, the professor accused of racism got away with it, but with the progress that has been made, a professor in today’s society would hopefully not be able to get away with something like this. In 2015, a film called Ninth Floor premiered, documenting the lives of different individuals whose lives were changed by what happened at Sir George Williams University in 1969. The Sir George Williams Affair is a moment that had profound impacts at the time, and it still has an impact, even all these years later. 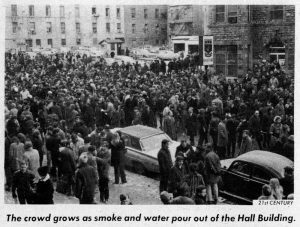 The largest student riot in Canadian history did not materialize out of thin air. To fully grasp why this riot took place, one needs to contextualize it on a provincial and global scale. The province of Québec, specifically the city of Montréal, was no utopia for Black Canadian immigrants during the 1960s. Racism, coupled with anti-immigrant sentiments, were daily stumbling blocks for the latter to overcome. For example, Black Canadians were often made to feel inferior as they entered restaurants in downtown Montréal. Their sense of inferiority was most acutely felt when they were looked down upon by customers of European descent or refused service by restaurant owners. Job discrimination was another common reality for many in the Black community as they often worked below their paygrade. Thus, due to their perpetual status as victims of bigotry in Montréal during the 1960s, many Black Canadians deemed it necessary to mobilize themselves and fight the good fight – that is, against racial discrimination. Multiple committees, such as the Caribbean Conference Committee, were established by persecuted immigrants of African/Caribbean descent. These committees varied in their size and scope. However, most shared the same long-term goal: raising the overall plight of Black Canadians in Montréal and elsewhere. Some committees had a larger societal impact than others. 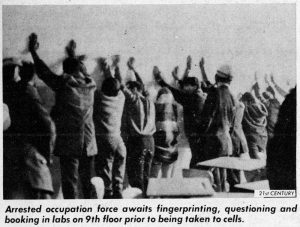 Members of the Caribbean Conference Committee arguably had the largest societal impact when, following a peaceful “sit-in” on the ninth floor of the Henry F. Hall Building (SGWU), they violently clashed with police. committees, such as the Caribbean Conference Committee, is one example. Members of these committees took it upon themselves to invite guest speakers on college campus and stage protests against racial discrimination, including one peaceful “sit-in” that went violently awry. This led to the largest student riot in Canadian history, which had long-lasting repercussions for immigrants of African/Caribbean descent. 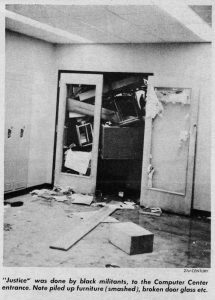 On February 11th, 1969, at Sir George Williams University in downtown Montréal, a group of aggressive students, in support of a political cause surrounding racism, destroyed a 1.4-million-dollar main computer and set fire to a data center. Black and White students of both sexes occupied the data center for two weeks and were peaceful until the morning of February 1st, where they decided to set fire to the center. The affair derived from distrust between student radicals and the university administrators that allegedly allowed an assistant biology professor named Perry Anderson to carry out a racist operation of continuously failing his black students. The policemen arrested 21 white women, 12 black women, 32 white men and 28 black men along with 3 juveniles. These students will be charged with conspiracy to commit mischief and arson. Though the number of students does not come close to equaling the amount there truly was during the riot. When they received information that a police squad received the right to barge in and arrest whomever they see, around 200 of the rioters escaped never to be caught or charged for what they took a part in. Montreal firemen arrived shortly after and water was war was poured from both inside and outside until it was completely put out. The first disturbance that morning came from the faculty lounge at 4 a.m. where the students smashes furniture, turned on fire hoses and barricaded any use of elevators. It started when they found out that the racism charges were planned to be dealt with by the school creating a committee with teachers and students to negotiate these kinds of situations. This angered the students because they felt like their charges weren’t being taken seriously. 250 Back and White men and women stood outside the school chanting how they did not want violence though many white students did not see how the riot was worth the school being destroyed for they were just there to receive an education and couldn’t relate to the rioters. Some parents were worried about their children rioters whom were stuck inside the building and weather they were safe or not. Montreal police handled the situation as peacefully as they could have with ensuring the safety of the students and staff. The Sir George Williams Affair is a moment of great significance for the Black community both on the local and the international level. Many scholars describe this event as being a spark leading to a Black renaissance in the city of Montreal. Although Black resistance against White repression had been deeply present in the city long before the riots took place, the affair helped the Black community take a stand and challenge the consensus over the White supremacy in the Canadian capitalist society. In fact, students targeted the computer room of the university with the belief that these technological objects symbolized the Western imperialism’s capitalist power over poor nations. The Sir George Williams Affair can therefore be understood as an illustration of the Black militancy in the face of white racism and abuse of black populations. Because of their broad socio-political agenda against discrimination, the student protests resulted in the coming together of various Black communities of Montreal. In fact, a great number of activists decided to translate this student movement into the community level by creating different organizations and institutions that would have the celebration and protection of Black identities as their main goal. There were also weekly meetings that were organized, known as the “Thursday Night Rally”, where guest speakers and community members would discuss on issues related to race and racism. The creation of communication media such as Black is Television also helped the community rally around the same cause and create a pan-African sense of unity. What has perhaps been the greatest local legacy is the foundation of the UHURU, a newspaper led by Black activists articulating the claims over justice of the black community. This provided a platform for Black ideas challenging the assumptions of the Western society without being censured or controlled by Whites. Thus, the Sir George Williams affair contributed to the formation of a pan-African solidarity movement that was consolidated through the creation of institutions promoting the identity and the voice of the Black community in Montreal. However, the repercussions of the affair weren’t limited to the local level. In fact, the intense media coverage of the events and their worldwide broadcast led to the eruption of protests against symbols of Canadian power throughout the Caribbean. An example would be how Canada’s Governor-General was confronted by hostile students in his visits in several countries of the region, especially in Trinidad where he had to be removed from the University of West Indies campus. Thus, a certain pan Africanism-Black Power that manifested itself through mass protestations and newspaper publications was activated overseas by the affair. Moreover, the 1970 trial of ten Trinidad nationals in Montreal accused of destroying the computers during the Sir George Williams affair sparked a series of mass demonstrations in Trinidad, which eventually threatened to overthrow Williams’ government. To conclude, the Sir George Williams affair was an important moment in Canadian history. The event was not a stand-alone occurrence, but rather a response to Canadian racism and long-established racialized conditions in Canada. Although the initial protest and riot only occurred in the beginning months of 1969, events leading up to it had been brewing since 28 April 1968. Moreover, Black radical politics in Montréal had gained a foothold since the 1960s. Although the riot never led to firing of Professor Perry Anderson, it had long lasting effects in Canada and abroad. The protest brought race relations to the forefront of the public’s attention. The public no longer had the luxury of turning a blind eye to racial discrimination in Montréal and the rest of Canada. With the aftermath of the riot, a multitude of Black organizations emerged with the goal of improving the quality of life of African Canadians through various means of social uplift, such as the establishment of committees and organizations. Some of these organizations included the following: Cote des Neiges Black Community Association; Black Coalition of Quebec; Notre-Dame-de-Grace Black Community Association; LaSalle Black Community Association; Quebec Black Board of Educators; Black Study Centre; Black Theatre Workshop; Black Is Television; Black Action Party. The creation of these organizations had a profound influence on the political and social attitudes of Canadians with respect to race relations. African Canadians subsequently lived in a more, though not fully, inclusive, equitable society. Thus, the riot, though unsuccessful in its initial goal, had a monumental and lasting impact on Canadian history. It illuminated the mistreatment of Black Canadian immigrant Black Canadian students at SGWU and throughout Canada. Looking back at this moment in history through a contemporary lens, it is also important to note that police brutality has a long history in North American and, unfortunately, has yet to be fully eradicated. Racial discrimination against Black Canadians is still a reality for many individuals. However, race relations in Montréal and the rest of Canada were forever changed – that is, arguably for the better – as a long-term effect of the Sir George Williams affair. Austin, David. “All Roads Led to Montreal: Black Power, the Caribbean, and the Black Radical Tradition in Canada.” The Journal of African American History 92, no. 4 (2007): 516-539. http://www.jstor.org/stable/20064231. Balfour, Clair. “1.4 million loss at Sir George Williams Students Destroy Computer.” Accessed March 1, 2018. Forsythe, Dennis. 1971. Let the Niggers burn: The Sir George Williams University affair and its Caribbean aftermath. Montreal: Our Generation Press. Mills, Sean. 2010. The empire within: postcolonial thought and political activism in sixties Montreal. Montreal: McGill-Queen’s University Press. http://www.deslibris.ca/ID/436085. Benjamin Talton, 1960s Africa in Historical Perspective: An Introduction, Journal of Black Studies Vol. 43, (2012), 4. Dorothy W. Williams, The Road to Now: A History of Blacks in Montreal (Montreal: Véhicule Press, 1997), 39. Benjamin Talton, “1960s Africa in Historical Perspective: An Introduction,” Journal of Black Studies 43, no.1 (2012): 4. Austin, David. 2007. “All Roads Led to Montreal: Black Power, the Caribbean, and the Black Radical Tradition in Canada”. The Journal of African American History. 92 (4): 530. Austin, David. “All Roads Led to Montreal: Black Power, the Caribbean, and the Black Radical Tradition in Canada.” The Journal of African American History 92, no. 4 (2007): 535. http://www.jstor.org/stable/20064231. Austin, David. “All Roads Led to Montreal: Black Power, the Caribbean, and the Black Radical Tradition in Canada.” The Journal of African American History 92, no. 4 (2007): 530. http://www.jstor.org/stable/20064231. Published by arianegautrin on March 2, 2018 at 2:40 pm under Uncategorized.